Again. It's difficult to post with four small children running around your house. But today is their last day here *cries*, so I'll have time to post. Today's is written by Cait Potter. When people think of surrealism their minds usually lock onto Dali and dream interpretation and of course, with its main connotations being weird and strange and illogical, it’s easy to see it as something unapproachable, only attempted by the strangest among us. But there is a sense to it, a method. Surrealism started as a movement in the 1920s, deep-rooted in politics and the ideas of dreams, such as the practice of dream interpretation Freud was bringing to light, artists and writers of that time explored reality in a way the completely uprooted it. But at the same time, creating work that made complete sense. By bringing a sense of familiarity to the viewer or reader. The idea was to take reality and twist it through dreams and the subconscious. Much the same way things feel familiar in a dream. What you’re writing has to be real, quite possibly as real as you can make it and then you explore everything behind it. Reading between the lines so to speak. Finding the symbols then asking yourself, What do they mean? Is that house really just a house to that character? What does it mean to the character? Reality can be perceived in many different ways by many different people and surrealism offers a way to do that. 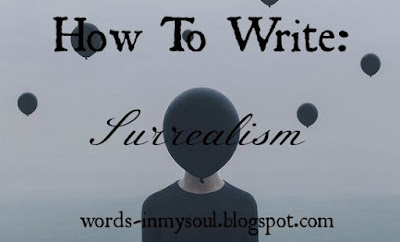 It’s been argued that surrealism isn’t about the content of the story but how you write it and since surrealism is a broad movement thus having a broad definition, I feel that it can be both. Automatic writing conjures the imagery of a psychic hunched over a crystal ball scribbling down the messages they scried from the future. That’s all well and good but I raise you the image of a simple writer, hunched over for completely different reasons, pen whipping across the page like their hands are on fire. Automatic writing or stream of consciousness is one of the main surrealist techniques, used by the great artists of however many years ago, it creates a sense of flow that you might not have if you were actively thinking about what goes where in your story. I reckon every writer has tapped into this flow at least once. It’s hard to say what gets you into that zone because it’s different for everyone! Music certainly helps me! For me, everything slows down, I get uber-focused on my writing and I fall into this lull. It feel like the words are just floating out of my brain and the next thing I know I’ve written 6000 words and I feel like I’m going to pass out! Anything is possible I guess! In writing surrealism, your main goal is to immerse your reader into the story. I find that some good ole world building can really push you in that direction. It’s all well and good throwing things in there for affect or aesthetic until you find that those things have absolutely no purpose. When it comes to surrealist settings that familiarity really comes into play. Your character will only notice certain things in that setting, things that stand out or are familiar to them. Make those things important; tie your character to the setting by giving them something they can relate to. Build the atmosphere with emotion and symbolism. Focus on your character and build the world around them. Is something going to attack me? Makes those shadows on the walls appear like more than just shadows. Many writers can have surrealist vibes (I bring to mind The Secret History By Donna Tart and The raven Cycle by Maggie Stiefvater) and so can genres, like sci-fi and punk subgenres like cyberpunk and steampunk. But when I think of surrealist writing I think of writers such as Kafka and Vonnegut. Writers that birth incredibly absurd stories into the world while at the same time dealing with dark, almost too real themes. Kurt Vonnegut, in his book Slaughterhouse 5 examines aliens keeping a human zoo, the end of the world and concept of a character that can, or believes he can, travel through time. But he also deals with heavy themes like war, death, even PTSD. To me, surrealism is a way of exploring the bad things in the world in a way that makes them less harsh, easier to comprehend, offering an escape in a sense. I hope all of the tish tosh above made sense! Cait Potter is an 18 year old artist, writer and photographer. They spend most of their time scribbling odd things and working on one too many projects. You can follow them on Instagram here.